More than 130 prisoners are on the run in Mexico after a mass breakout from a jail close to the US border. The inmates escaped through a tunnel dug out from the prison's carpentry workshop to a perimeter fence. 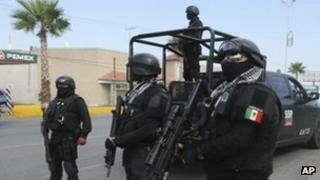 The prison director and two other employees are being held over the incident at the facility in Coahuila, the state's attorney-general said. A massive manhunt is under way, and the US authorities are on alert in case any escapees attempt to cross the border. Some 132 men managed to escape from the prison in the city of Piedras Negras, which borders Eagle Pass in Texas to the north. One by one, they fled through a tunnel measuring 2.9m (9.5 ft) deep and 7m long, Attorney-General Homero Ramos said. The state government has offered rewards of 200,000 pesos ($15,600; £9,600) for information leading to the arrest of each prisoner. This is not the first time such a mass breakout has taken place in Coahuila, but it is by far one of the biggest in recent years, says the BBC's Will Grant in Mexico City. Such events only go to underline further to the incoming government of President-elect Enrique Pena Nieto the dire state of the prison system in Mexico, our correspondent says. Mr Pena Nieto is to take office on 1 December. However, prison reform is not expected to be one of the main priorities of his government, our correspondent adds.